This is probably the most common “pasta cooking” mistake. The very minimum that the experts recommend is four quarts of water for one pound of pasta. But Italian chefs and pasta experts use more than that; between five and six quarts of water for each pound of pasta. This gets the very best results. Why is all that water necessary? Because pasta needs enough space to move around in order to cook properly. Not using enough water causes the pasta to stick to the side of the pan, which makes it thick, sticky and unpleasant. When you use enough water you will definitely notice the difference in the taste and texture. It is hard to determine just where this idea came from originally but 44 per cent of Americans say they add olive or other oil to the cooking water. I suspect the idea is that the oil will stop the pasta from sticking together. But what it actually does is make the pasta too slick for any sauce to stay on it properly. 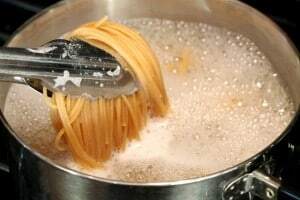 If you have used enough water and remember to stir your pasta regularly as it is cooking, it will not stick together. Therefore – no need to add oil. Because we are constantly warned about the perils of salt in our diet, many cooks will add only a tiny pinch of salt or none at all, to the cooking water. This is a mistake. Pasta needs plenty of salt because salt “roughs up” the surface and keeps it from becoming slimy. Add about a teaspoon of salt per each gallon of water. This seems like a lot but every good Italian chef cooks it this way and it really does make a difference. And here’s the good news: The pasta does not absorb salt in the same way that vegetables or potatoes do, so you will not be eating all the salt that you use in the cooking water. The exception to the ‘add plenty of salt’ rule is when cooking fresh pasta, which does not need salted water. The fact that it’s fresh negates the need for salt because fresh pasta has a different surface than dried pasta. Pasta must be cooked in boiling water from the start. Add the pasta to the pot when the water has come to a full rolling boil. It will stop boiling when you add the pasta so make sure you get the water boiling again as quickly as possible. To add pasta to cold water and then heat up the water is a sure guarantee pasta will not cook properly. Pasta needs to be stirred while it is cooking. This stops it sticking together (especially spaghetti and linguine). When pasta doesn’t stick together it all cooks consistently. Different people will cook the same pasta for as much as five minutes difference and each will claim they have cooked their pasta perfectly. But, while accepting that taste is a subjective thing, there are people who undercook their pasta and people who overcook their pasta. Undercooking is less common because undercooked pasta is crunchy and obviously difficult to chew. Overcooked pasta (much more common) is limp, loses its shape easily, and won’t hold a sauce well. Unfortunately, overcooked pasta is not salvageable so you’ll have to throw it away and start again. The key to cooking pasta well is to keep testing it as you cook it. There will be a guide cooking time on the packet so about a minute before that time is up, start testing the pasta. It is ready when it is slightly firm to the bite – a state the Italians call “al dente” (firm but not crunchy). At the al dente stage, turn off the heat and drain the pasta in a colander. Shake the pasta to get rid of all excess water (be especially careful to do this if they are pasta shapes which catch pockets of hot water) and serve immediately. The pasta continues to cook while it’s draining it in the colander, so when you are testing, remember that what you eat will be cooked for a minute or two longer than what you’re testing in the pan. 51 per cent of Americans say they rinse their pasta immediately after cooking. This ruins good pasta. When pasta reaches the al dente stage it means thereare just the right amount of starches on the surface to absorb the sauce you will serve with it, which is where pasta gets its entire flavor. If you rinse, you take away these important starches. There are two exceptions. First – if you’re cooking for a pasta salad, the pasta does need to be rinsed because you don’t want the pasta to be sticky if it’s being used in a salad. After rinsing with boiling water then rinse again with cold water to stop the cooking process. The second exception is if you have cooked your pasta in too small a pan and the water is cloudy and starchy. In that case it may be worth rinsing the pasta with boiling water to remove these starches. By stepping out of your comfortable cooking routine and implementing these tips, you will be cooking pasta correctly. The difference is substantial. I promise you that your pasta will be cooked to perfection and will taste delicious with your favorite sauce. Patti Mays is an expert cook who’s all about delicious, simple, affordable foods. Her down-to-earth website features tried & true recipes that are easy to make; helpful tools & gadgets, (most of which can be ordered on the site) great ideas, and tips. She has developed a large following because of her unpretentious style and humorous approach to life. Patti and her husband live in Boise, Idaho.